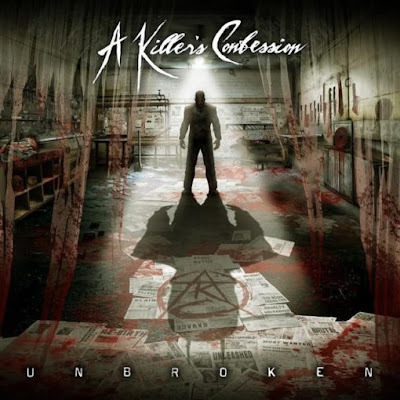 With former Mushroomhead frontman Waylon Reavis at the helm and Richard Easterling (American Head Charge) behind the mixing board, you might think you have A Killer’s Confession and their debut release Unbroken pegged, but you wouldn’t be entirely correct. While Reavis and company put to wax many of the things you’d expect (“Awakening” plays like a demented haunted house anthem, or something a serial killer would play before he makes you his next victim, “Spawn of 7” is fueled by jilted staccato riffs and sludgy industrial tones, which spill over onto the menacing, Brian Welch-assisted “A Killer’s Confession,” sonic juggernaut “I Will Define” gets back to powerhouse old school heavy metal riffing thanks to an appearance by Dead By Wednesday), Unbroken takes chances, not all of which pan out. The album shines when it focuses on straight up melodic metal ala In Flames (“Rebirth,” “Final Breath”), but for as good as the first portion of Unbroken is, it fades down the stretch. While not entirely a swing-and-miss, “Sympathy,” a high-arching and airy ballad that features Kimberly Freeman of One Eyed Doll, seems strangely out of place, “Judas Kiss,” an ill-fated foray into electro-metal featuring Revillusion, sounds like a poor man’s Celldweller and “Letting Go,” with Amerakin Overdose, is a jumbled mess of noisy synth. Thankfully, the closing “Purification” (with HEX) is a fun Rammstein-esque romp. Unbroken may be a few tracks too long, but it’s mostly good.